Neonates often generate incomplete immunity against intracellular pathogens, although the mechanism of this defect is poorly understood. An important question is whether the impaired development of memory CD8+ T cells in neonates is due to an immature priming environment or lymphocyte-intrinsic defects. In this article, we show that neonatal and adult CD8+ T cells adopted different fates when responding to equal amounts of stimulation in the same host. Whereas adult CD8+ T cells differentiated into a heterogeneous pool of effector and memory cells, neonatal CD8+ T cells preferentially gave rise to short-lived effector cells and exhibited a distinct gene expression profile. Surprisingly, impaired neonatal memory formation was not due to a lack of responsiveness, but instead because neonatal CD8+ T cells expanded more rapidly than adult cells and quickly became terminally differentiated. Collectively, these findings demonstrate that neonatal CD8+ T cells exhibit an imbalance in effector and memory CD8+ T cell differentiation, which impairs the formation of memory CD8+ T cells in early life. Neonates are highly susceptible to infection and often experience more severe disease than adults (1–3). Recurrent infections with the same intracellular pathogen are common (4), indicating an impaired ability to develop long-lasting protective CD8+ T cell immunity. However, the key mechanisms involved in the poor generation of memory CD8+ T cells in early life remain obscure. In healthy adults, viral and intracellular bacterial infections generally result in the formation of memory CD8+ T cells. This process is initiated with the stimulation of naive CD8+ T cells by APCs bearing a microbe-derived peptide bound to host MHC class I molecules (5, 6). After Ag recognition, naive CD8+ T cells expand up to 50,000-fold and differentiate into effector CD8+ T cells equipped with cytokines and cytolytic molecules, which are capable of defending the host (7–9). Once the infection has been cleared, 90–95% of effector CD8+ T cells are eliminated by apoptosis. The remaining 5–10% of effector cells transition into the long-lived memory pool and provide the host with an accelerated response to repeat infections, because of their increased precursor frequency and more rapid acquisition of effector functions (10–12). There is a limited capacity to generate cellular immunity in early life, which has often been attributed to a delay in the maturation of the innate immune system in neonates. Numerous studies have demonstrated that neonatal innate immune cells produce less IL-12 and more IL-10 after TLR stimulation compared with their adult counterparts (13–16). Consequently, strategies to augment the development of memory T cells in early life have largely focused on identifying appropriate adjuvants or fine-tuning delivery systems to enhance T cell priming (1, 17, 18). However, cell-intrinsic differences in the neonatal adaptive immune system have also been described and may contribute to an altered program of memory T cell development. For example, CD4+ T cells from neonatal mice and humans produce greater amounts of Th2 cytokines (IL-4, IL-13) than adult CD4+ T cells after stimulation with anti-CD3 and anti-CD28 Abs in vitro (19, 20). Moreover, a biased Th2 memory response is observed when neonatal CD4+ T cells are primed in adult recipient mice (21), but not when adult CD4+ T cells are primed in newborn mice (22), suggesting that cell-intrinsic differences are an important factor contributing to neonatal T cell immunity. In contrast with CD4+ T cells, much less is known about cell-intrinsic differences between neonatal and adult CD8+ T cells. Thus, it remains unclear whether impaired neonatal memory CD8+ T cell development is due more to extrinsic factors in the host environment or because the starting population of CD8+ T cells is intrinsically different before infection. Understanding the relative contribution of environmental and cell-intrinsic differences to impaired neonatal memory CD8+ T cell formation is essential for development of strategies to enhance immunity in neonates. In this report, we asked whether intrinsic differences between neonatal and adult CD8+ T cells contribute to impaired memory formation in early life. However, identifying cell-intrinsic differences in neonatal memory CD8+ T cell development requires a direct comparison with adult CD8+ T cells, which is complicated by the fact that neonatal mice have 10–100 times fewer CD8+ T cells than adults (23, 24) and express a highly restricted and structurally distinct TCR repertoire (25, 26). Therefore, we used an experimental strategy in which equal numbers of neonatal and adult CD8+ T cells expressing an identical TCR are responding to infection in the same host. These studies revealed dramatic differences in the fate of neonatal and adult CD8+ T cells, which are independent of the host environment. Unexpectedly, neonatal CD8+ T cells responded more rapidly to infection than adult cells, but quickly became terminally differentiated and incapable of converting to the memory cell lineage. Our results provide new insight into the factors underlying age-related differences in the CD8+ T cell response and demonstrate that adult CD8+ T cells have a greater intrinsic capacity than neonatal CD8+ T cells to undergo memory cell differentiation. B6-Ly5.2/Cr mice were purchased from the National Cancer Institute colony (Fredrick, MD). gBT-I TCR transgenic mice (mice transgenic for TCRαβ specific for the HSV-1 glycoprotein B498–505 peptide SSIEFARL [gBT-I in the text]) were provided by Dr. Janko Nikolich-Zugich (University of Arizona, Tucson, AZ) and crossed with B6-Thy1.1/CyJ mice, which were obtained from The Jackson Laboratory. All neonatal gBT-I pups were used at 6–7 d after birth and adults were used at 2–4 mo of age. Only male mice were used for experiments, and all mice were maintained under pathogen-free conditions at Cornell University College of Veterinary Medicine, accredited by the American Association of Accreditation of Laboratory Animal Care. The experiments in this study were performed in strict accordance with the recommendations in the Guide for the Care and Use of Laboratory Animals of the National Institutes of Health. The protocols were approved by the Institutional Animal Care and Use Committee at Cornell University. mAbs anti-CD8α (53-6.7), anti-CD4 (GK1.5), anti-CD45.1 (A20), anti-CD45.2 (104), anti-CD90.1/Thy1.1 (OX-7), anti-KLRG1 (2F1), anti-CD127 (A7R34), anti-CD27 (LG7F9), anti-CD62L (MEL-14), anti–IL-2 (JES6-5H4), anti-Bcl6 (mGI191E), anti–T-bet (eBio4B10), anti-Eomes (Dan11mag), anti–TNF-α (MP6-XT22), anti–IFN-γ (XMG1.2), and anti-granB (GB11) were purchased from Biolegend (San Diego, CA), eBioscience (San Diego, CA), or Invitrogen (Carlsbad, CA). Flow cytofluorimetric data were acquired on the custom FACS LSRII instrument equipped with four lasers, using the DiVa software (BD Biosciences, Mountain View, CA). Analysis was performed using the FlowJo software (Tree Star, Ashland, OR). After magnetic cell purification (see later), CD8+ T cells were resuspended in PBS and labeled with CFSE as described by Quah et al. (27). CFSE-labeled cells were resuspended in RPMI 1640 (Lonza, Basel, Switzerland) supplemented with 10% heat-inactivated serum (PAA Laboratories, Pasching, Austria), l-glutamine, and Pen-strep. For all stimulation, exogenous IL-2 (100 U/ml) was added at the time of stimulation. In experiments conducted with polyclonal cells from B6 mice, cells were stimulated with plate-bound anti-CD3 (5 μg/ml) and anti-CD28 (20 μg/ml; Biolegend). gB transgenic cells were stimulated with cognate peptide (SSIEFARL; gB-8p [21st Century Biochemicals, Marlboro, MA]). Wild-type (WT) Listeria monocytogenes stably expressing the MHC class I–restricted epitope HSV gB498–505 (gB-8p), designated LM-gB (28), was generously provided by Dr. Sing Sing Way (Cincinnati Children’s Hospital, Cincinnati, OH). Before infection, Lm-gB was freshly plated on brain-heart infusion media plates containing streptomycin selection antibiotic. Colonies were selected from the plate for growth in liquid culture. Bacteria were grown to log phase and mice were injected i.v. with either 5 × 103 CFU in 100 μl PBS for naive mice (∼0.1 LD50) and 5 × 104 CFU for immune mice to demonstrate protective immunity. Recombinant vaccinia virus expressing the MHC class I–restricted epitope HSV gB498–505 (gB-8p), designated VACV-gB (25), was generously provided by Dr. S.S. Tevethia (Pennsylvania State University, College of Medicine). VACV-gB viral stocks were propagated and quantified in 143B cells (American Type Culture Collection). Mice were infected with 2 × 105 PFU. Splenocytes were collected from congenic gBT-I mice of different ages and “untouched” transgenic CD8+ T cells were isolated using negative immunomagnetic selection. In brief, washed splenocytes were incubated with a mixture of biotinylated Abs (anti-CD4, anti-CD19, anti-CD16/32, anti-Ter119, anti-MHC class II, and anti-CD44 [Biolegend]) and subsequently incubated with streptavidin-coated microbeads (Miltenyi Biotec, Auburn, CA). Cells were then passed over an LS magnetic column (Miltenyi Biotec) according to the manufacturer’s instructions. The CD8-enriched splenocytes from neonatal (30–60% purity) and adult (85–90% purity) donors were combined such that the number of gBT-I CD8+ T cells was equal. The combined cells were then transferred i.v. into adult B6-Ly5.2 recipient mice. For studies that examined primary, memory, and secondary phases of the response, we transferred 1 × 104 gBT-I cells from each age group. For studies assessing early time points of infection, we transferred 5 × 104 gBT-I cells from each age group. The next day, recipients were infected with either WT LM-gB (5 × 103 CFU i.v.) or VACV-gB (2 × 105 PFU i.p.). Recipient mice were either bled on indicated days postinfection or euthanized and indicated tissues were harvested. For assessment of effector function, donor gBT-I cells were restimulated for 5 h in the presence of brefeldin A with or without 10−7 M gB peptide before intracellular staining using intracellular fixation and permeabilization buffers (eBioscience) according to manufacturer’s instructions. Positive populations were determined by comparing the same samples with and without peptide. Transcription factors were assayed using the Foxp3 staining buffer set (eBioscience) according to manufacturer’s instructions. Cell sorting and RNA isolation. For RNA sequencing, we took splenocytes at the peak of infection (day 7 for WT Lm-gB), sorted via negative magnetic selection, as described earlier; cells were then labeled with anti–CD4-Alexa 700, anti–CD8-e450, anti–CD45.2-allophycocyanin e780, anti–CD45.1-PE-Cy7, and anti–Thy1.1-allophycocyanin for 60 min. Labeled cells were washed twice and placed in sorting buffer (PBS + 0.1% BSA + 2 mM EDTA). For individual mice, we either sorted for CD8+CD4−CD45.2−CD45.1+Thy1.1− (neonatal donor) or CD8+CD4−CD45.2−CD45.1+Thy1.1+ cells (adult donor) and achieved >95% purity. Sorting was performed on a FACS Aria III (BD Biosciences). After sorting, RNA was isolated by TRIzol (Invitrogen) extraction. After RNA isolation, 200 ng total RNA was prepared for RNA Sequencing using the TruSeq RNA Sample Preparation Kit (Illumina). The resulting cDNA libraries were sequenced on the Illumina Hi-Seq platform, generating 100 bp reads. Reads were aligned to the mouse genome (mm9) using the TopHat analysis package (29). The TopHat tool CuffDiff (30) was used to determine which genes had significantly different expression between adults and neonates. It accounted for variation between the two biological replicates in the input data and performed multiple test correction using a false discovery rate of 5%. In these analyses, a pseudocount of 0.1 was added to each fragments per kb of exon per million fragments mapped (FPKM) value. For genes with multiple splice isoforms, only the isoform with the highest expression level was considered. The data discussed in this publication have been deposited in National Center for Biotechnology Information’s Gene Expression Omnibus (31) and are accessible through Gene Expression Omnibus Series accession number GSE56575 (http://www.ncbi.nlm.nih.gov/geo/query/acc.cgi?acc=GSE56575). Statistical analysis (except for RNA sequencing, see later) was performed using Prism software (GraphPad). Error bars represent SEM unless otherwise noted. Significance was determined by paired t test or one-way ANOVA followed by Dunnett’s multiple comparisons test, as indicated in the figure legends. Significance is denoted as follows: ***p < 0.001 and ****p < 0.0001. The goal of this study was to determine how cell-intrinsic factors alter the CD8+ T cell response in early life. We first asked whether neonatal CD8+ T cells respond differently than adult CD8+ T cells to in vitro stimulation. Naive (CD44lo) CD8+ T cells from neonatal (6–7 d old) and adult (2–4 mo old) C57BL/6 mice were magnetically isolated, labeled with proliferation dye (CFSE), and activated via the TCR with anti-CD3 and anti-CD28 Abs to ensure that all cells were stimulated equally. After 3 d, we examined cellular proliferation, as determined by the amount of CFSE dilution, and found that neonatal CD8+ T cells had divided significantly more than adults (Fig. 1A). However, one key variable not controlled for in these experiments was developmental differences in the TCR repertoire. This is important because our group and others have shown that the neonatal CD8+ T cell pool is composed of shorter and less diverse TCRs (25, 26). To control for TCR repertoire differences, we next compared neonatal and adult CD8+ T cells that express the same TCR. For these experiments, CD8+ T cells were isolated from neonatal and adult TCR transgenic mice that express an H-2Kb–restricted TCR specific for the HSV-1 gB glycoprotein, denoted gBT-I mice (32), and stimulated with gB-8p peptide (SSIEFARL). We again observed more extensive proliferation by neonatal CD8+ T cells (Fig. 1B). We also assessed proliferation in cultures not containing exogenous IL-2 and still found that neonatal cells undergo more extensive proliferation (data not shown). Collectively, these results suggest that CD8+ T cells are intrinsically more reactive in early life. 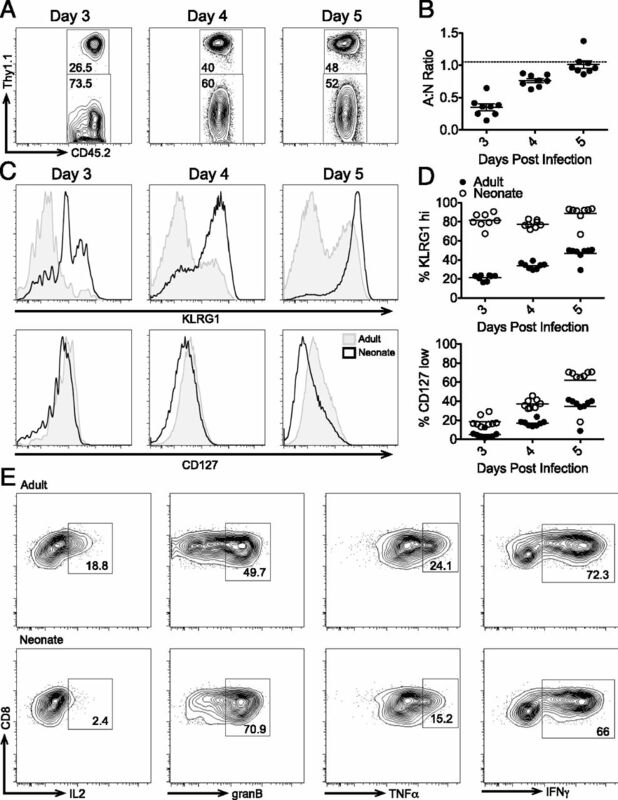 Neonatal CD8+ T cells proliferate more than their adult counterparts. 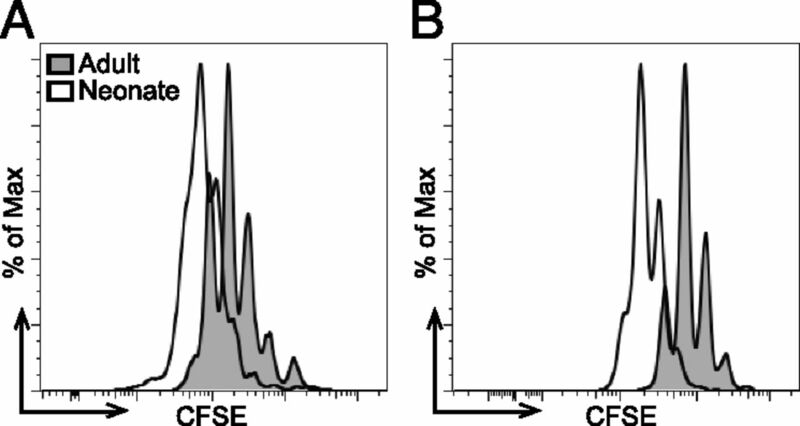 (A) Untouched CD8+ T cells from adult (shaded) or neonate (line) C57BL/6 mice were labeled with CFSE and stimulated with plate-bound anti-CD3/anti-CD28. (B) CFSE dilution in gB peptide (10−9 M)–stimulated gBT-I CD8+ T cells from adult or neonatal mice. Data are representative of at least three independent experiments. We next sought to determine the extent to which cell-intrinsic differences alter the CD8+ T cell response to infection. Our approach was to cotransfer the same number of neonatal and adult gBT-I donor cells into an adult recipient mouse and to compare their ability to respond to microbial challenge. By comparing equal numbers of monoclonal neonatal and adult CD8+ T cells in the same environment, we were able to focus specifically on cell-intrinsic differences. To this end, low numbers (1 × 104) of neonatal (Thy1.2) and adult (Thy1.1) gBT-I cells were magnetically isolated and cotransferred into adult recipient (Ly5.2) mice (Fig. 2A). The next day, recipient mice were systemically infected with a recombinant L. monocytogenes expressing the gB peptide (LM-gB), and the ratio of adult and neonatal donor cells was tracked in the blood throughout the course of infection. Consistent with the in vitro studies, the data showed that neonatal gBT-I CD8+ T cells dominated the response early postinfection (4 d postinfection). However, most neonatal cells were not able to survive contraction and transition into the long-lived memory pool (Fig. 2B, 2C). Upon secondary challenge, the few remaining neonatal gBT-I cells failed to undergo robust expansion, and the recall response was almost entirely composed of adult gBT-I memory cells (Fig. 2B, 2C). Similar results were obtained in experiments in which the congenic markers on neonatal and adult gBT-I donor cells were switched (Supplemental Fig. 1A), demonstrating that minor genetic differences associated with crossing gBT-I mice to different congenic strains do not significantly contribute to the CD8+ T cell response. Neonatal CD8+ T cells fail to transition into the memory pool. (A) Schematic of experimental design: 1 × 104 gBT-I CD8+ T cells from congenic adult (Thy1.1) and neonatal (Thy1.2) donors were cotransferred i.v. to congenic, WT recipients (CD45.1). These recipients were then infected with 5 × 103 CFU WT Lm-gB and serially bled to monitor donor-specific CD8+ T cell responses. (B) Relative numbers of donor adult (solid) or neonatal (dashed) gBT-I CD8+ T cells postinfection and subsequent challenge (5 × 104 CFU WT Lm gB). (C) The ratio of the donor populations with respect to time. Dashed line indicates starting ratio of donor cells. (D) At 70 d postinfection, peripheral organs were harvested and the ratio of adult to neonatal CD8+ donor cells was assessed. Significance was determined by one-way ANOVA followed by Dunnett’s multiple-comparisons test. Data are representative of 2–4 experiments (n = 4–8 mice/group). ***p < 0.001. One possible explanation for the reduced numbers of neonatal memory CD8+ T cells detected in the blood could be that neonatal memory CD8+ T cells preferentially localize to other compartments in the host. To address this possibility, we also examined the ratio of neonatal and adult gBT-I cells in secondary lymphoid tissue and various peripheral organs at resting memory. In most tissues, we observed the same 4- to 5-fold increase in adult gBT-I cells, although nearly 10 times more adult gBT-I cells were detected in the lymph nodes (Fig. 2D). Overall, these data are consistent with observations made in the blood and demonstrate that there are fewer neonatal memory gBT-I cells throughout the host. Another important control was to verify that neonatal and adult gBT-I cells seed adult recipient mice to a similar extent before infection. To test this, we cotransferred equal amounts of neonatal (Thy1.2) and adult (Thy1.1) gBT-I CD8+ T cells into uninfected adult recipient mice (Ly5.2) and examined the ratio of donor cells in the spleen the next day. These ratios were found to be nearly identical to the original inocula (Supplemental Fig. 1B, 1C), demonstrating that the colonization of adult recipient mice by neonatal and adult donor CD8+ T cells is equivalent and that the reduced number of neonatal memory CD8+ T cells is not due to less efficient engraftment by neonatal donor gBT-I cells. The impaired development of neonatal memory CD8+ T cells prompted us to compare the phenotype of neonatal and adult donor CD8+ T cells throughout the course of infection. At various times, spleens were harvested and the expression levels of cell-surface receptors associated with short-lived effectors (KLRG1) and long-lived memory precursor cells (CD127, CD27, CD62L) were measured (Fig. 3A, 3B). Although the numbers of neonatal and adult donor cells were similar at the peak of the primary response, a higher proportion of neonatal donor CD8+ T cells expressed a short-lived effector phenotype (KLRG1hi, CD127lo, CD27lo, CD62Llo), whereas adult donor CD8+ T cells exhibited more of a memory precursor phenotype (KLRG1lo, CD127hi, CD27hi, CD62Lhi). The small number of neonatal donor CD8+ T cells that survived contraction predominantly expressed KLRG1 and were still capable of secreting IFN-γ in response to peptide stimulation (Fig. 3A, 3C). However, neonatal donor cells more slowly upregulated the lymph node homing molecule CD62L, which is consistent with the lower numbers of neonatal memory CD8+ T cells found in the lymph nodes during later stages of infection. Importantly, neonatal and adult CD8+ T cell express similar percentages of KLRG1, CD127, CD27, and CD62L before adoptive transfer, indicating that phenotypic differences between different aged donor cells arose in response to infection (Supplemental Fig. 2). Collectively, these data suggest that the inability of neonatal CD8+ T cells to differentiate into memory cells and elicit robust recall responses may be linked to their acquisition of a more terminally differentiated phenotype. Neonatal CD8+ T cells exhibit a more differentiated phenotype. (A) Splenocytes were harvested at indicated days postinfection, and donor CD8+ T cells from congenically marked adult (shaded) and neonatal (line) were assessed for surface expression of CD127, KLRG1, CD62L, and CD27. Histograms show representative data from each time point. (B) Statistical analysis of phenotypic markers over all recipient mice on day 7 postinfection. (C) IFN-γ production was assayed by peptide restimulation of splenocytes on indicated days postinfection. Histograms show representative data from each time point. Significance was determined by paired t test. Data are representative of 4 experiments (n = 4–8 mice/group). ***p < 0.001, ****p < 0.0001. To better understand when neonatal and adult CD8+ T cells adopt a different fate, we performed a detailed analysis of donor cells at early time points postinfection. Although previous studies have indicated that TCR transgenic CD8+ T cells behave most like endogenous T cells when low numbers of cells are used (33), it is technically challenging to detect donor cells at early time points when only 2 × 104 cells are transferred (previously shown to be the required number of cells that gives an equal ratio of transgenic to endogenous cells postinfection) (32). Therefore, we adoptively transferred graded numbers of gBT-I cells and found 1 × 105 cells (5 × 104 of each donor) to be the lowest input number of donor cells required to visualize neonatal and adult donor cells on day 4, while not significantly changing the phenotype of neonatal and adult gB-I cells at later times postinfection (Supplemental Fig. 3). Using this higher precursor frequency of donor cells, we compared the ratio of neonatal and adult gBT-I cells in the spleen from days 3–5 postinfection with LM-gB. The data showed that neonatal donor CD8+ T cells expand more rapidly than adults at 3 d postinfection (Fig. 4A, 4B), which is consistent with our in vitro data showing more extensive cell division by neonatal CD8+ T cells after stimulation. However, the numbers of neonatal and adult CD8+ T cells were similar at 5 d postinfection (Fig. 4A, 4B), indicating that the more rapid expansion of neonatal CD8+ T cells was not sustained. 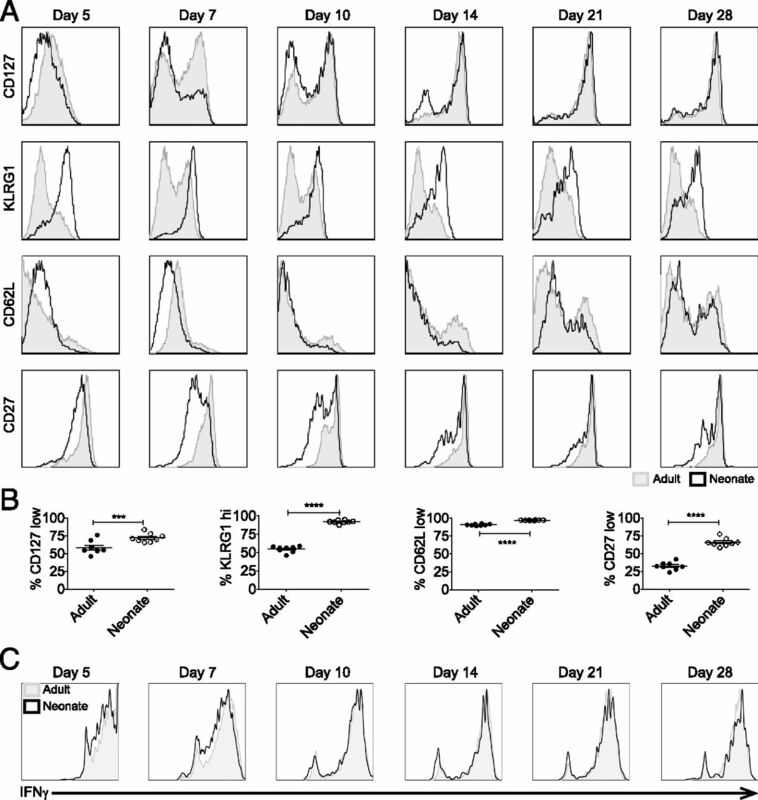 Neonatal CD8+ T cells rapidly become terminally differentiated. A total of 5 × 104 congenically marked gBT-I cells from each age group (adult and neonate) were transferred into congenically marked recipients, and spleens and lymph nodes were harvested at the indicated time points. (A) Neonatal donor gBT-I (Thy1.1−) cells are more numerous than adult donor gBT-I (Thy1.1+) early in infection; representative plots of donor cells are shown. (B) Ratio of adult to neonatal donors in the spleens of all recipients at early time points; dashed line indicates starting ratio of donor cells. (C) Representative histograms show that neonatal donor cells (black line) rapidly acquire the phenotype of short-lived effector cells (KLRG1hiCD127low). (D) Percentage of donor neonatal and adult CD8+ T cells that are either KLRG1hi or CD127low. (E) Acquisition of effector functions by adult (top) and neonatal (bottom) donor CD8+ T cells in the lymph nodes at 4 d postinfection. Data are representative of 2–3 experiments (n = 4–8 mice/group). We also examined changes in the expression of phenotypic markers at early times postinfection (Fig. 4C, 4D). Effector CD8+ T cells that are fated to become memory cells are believed to express CD127 (IL-7Rα). Our analysis of neonatal and adult gBT-I cells revealed a more dramatic downregulation of CD127 by neonatal donor cells from days 3–5 postinfection. We also measured the expression of KLRG1, which has previously been shown to be a marker of terminal differentiation. Strikingly, nearly all (81%) neonatal gBT-I cells expressed KLRG1 at 3 d postinfection, compared with only ∼21% adult donor CD8+ T cells. To look at effector functions in these populations at these very early time points, we assessed cytokine production in the lymph node (Fig. 4E). Secretion of IL-2 is associated with increased memory potential (34), and we found that adult CD8+ T cells were producing IL-2. In contrast, more neonatal CD8+ T cells were making granzyme B, an effector function acquired after extensive differentiation (35). Altogether, these findings demonstrate that neonatal CD8+ T cells are more rapidly driven down the effector differentiation pathway, making them less capable than adult CD8+ T cells to transition to the memory lineage at the peak of the response. 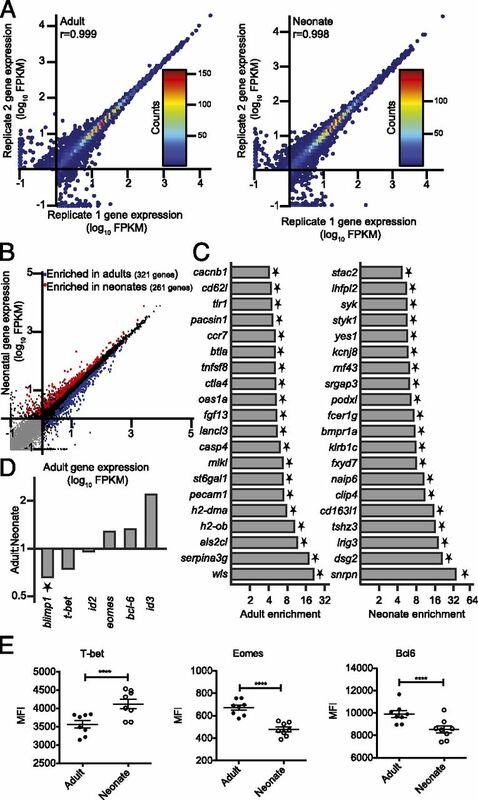 To better understand how neonatal CD8+ effector T cells differ from their adult counterparts, we sorted both donor populations at the peak of the primary response (7 d postinfection) and used RNAseq to compare their gene expression profiles. We mapped the sequencing reads to the mouse transcriptome, and found differentially expressed genes using TopHat and CuffDiff (29, 30). Expression values for genes correlated extremely well between two biological replicates, for both adults and neonates (Pearson r > 0.99; Fig. 5A), indicating that the data were robust. Of the 11,446 genes that met our gene expression cutoff, 321 were significantly more highly expressed in adults, whereas 261 were significantly more highly expressed in neonates (Fig. 5B). These data show that adult and neonatal effector cells exhibit significantly different gene expression patterns. Gene expression differences between adult and neonatal effector cells. (A) Gene expression values (FPKM) for each gene from RNA-seq data for two biological replicates of adults and of neonates were plotted. Adult sample pairs had Pearson correlation coefficient of 0.999 (p < 2.2 × 10−16), and neonate sample pairs had a Pearson correlation coefficient of 0.998 (p < 2.2 × 10−16). (B) Gene expression values for each gene were plotted as FPKM values from adult (x-axis) and neonatal (y-axis) samples. Genes in which the FPKM value was at least 1 in either sample were considered expressed (11,446 in total). The remaining 13,296 genes that did not reach that cutoff are shown in gray. Genes that are expressed at significantly (q < 0.05) higher or lower levels in adults as compared with neonates are highlighted in blue (321 genes) and red (261 genes), respectively. (C) Fold differences in expression for the most differentially expressed genes in adult and neonate effector cells. (D) Differential expression levels between adults and neonates are shown for transcription factors associated with effector cell and memory cell fate. (C and D) Genes marked with an asterisk are significantly differentially expressed (q < 0.05). (E) Cotransferred cells were recovered on day 7 postinfection (5 × 103 WT LmgB) and stained for intracellular expression of transcription factors. Significance was assessed by paired t test (n = 8). ****p < 0.0001. When we examined the gene expression profiles more closely, it was reassuring to observe 2.5-fold higher expression levels of CD127 and 2.3-fold less KLRG1 in adult effector cells (q < 0.01 for each), which is consistent with our results obtained by flow cytometry. To further characterize differences in gene expression, we focused on the 40 most differentially expressed genes (Fig. 5C and Supplemental Table 1A) and found that many transcripts associated with memory cell differentiation (CCR7, CD62L, Serpina3g) were preferentially expressed in adult effector cells. Interestingly, the most highly enriched gene in adult CD8+ T cells was wls, a key component of the Wnt pathway. In contrast, neonatal effector CD8+ T cells preferentially expressed a negative regulator of Wnt signaling (rnf43). These differences are notable because Wnt signaling was recently shown to play a role in the generation and persistence of memory CD8+ T cells (36, 37). Because adult cells more highly express genes associated with memory precursor cells, we investigated transcription factors associated with effector and memory cells (Fig. 4D and Supplemental Table 1B). We found that BLIMP1, a transcription factor known to drive effector cell differentiation, was significantly upregulated in neonatal donor cells. Other effector cell differentiation drivers (T-bet, Id2) also showed a trend toward higher expression in the neonatal donor cells, whereas transcription factors known to promote memory CD8+ T cell differentiation (Eomes, Bcl6, Id3) were enriched in adult donor cells. To confirm these differences, we assessed protein expression of a subset of these transcription factors and found that T-bet expression is significantly higher in neonatal CD8+ T cells, whereas Eomes and Bcl6 expression is significantly lower (Fig. 5E). In addition, we also compared the expression of genes involved in the intrinsic and extrinsic apoptosis pathway (Supplemental Table 1C). These data showed that neonatal effector cells express significantly higher levels of proapoptotic genes (FasL and Casp7), as well as lower levels of antiapoptotic genes (Bcl-2 and Bcl-w). Collectively, these genetic profiles are in line with our surface phenotype data showing neonatal CD8+ T cells preferentially develop into short-lived effector cells. All of our data thus far were obtained postinfection with L. monocytogenes. However, previous studies have demonstrated that memory CD8+ T cell differentiation is influenced by the nature of infection (38–41). Therefore, we asked whether our initial findings, seen after bacterial infection, could be extended to viral infections. For these experiments, we cotransferred neonatal and adult gBT-I cells into adult recipient mice before infection with a recombinant vaccinia virus expressing the gB peptide (VACV-gB) and allowed them to transition into the resting memory phase. At 50 d postinfection, all recipient mice were challenged with a heterologous pathogen to avoid Ab interference, and the memory recall responses by different aged donor cells were compared. Similar to results obtained with LM-gB infections, we again found that the majority of neonatal gBT-I donor cells expressed a terminal effector phenotype at the peak of the primary response and failed to survive contraction (Fig. 6). As a consequence, the resulting secondary effector response was almost entirely dominated by adult gBT-I donor cells (Fig. 6B). These data demonstrate that defects in neonatal memory formation are not limited to certain types of infections and suggest that the propensity to differentiate into a short-lived terminal effector is likely an intrinsic feature of the neonatal CD8+ T cell response. Failure to form CD8+ memory is a general feature of neonatal CD8+-mediated immune responses. A total of 1 × 104 gBT-I CD8+ T cells from both adult and neonatal donors were cotransferred i.v. to congenic, WT recipients. These recipients were then infected i.p. with 2 × 105 PFU VACV-gB. Recipient mice were serially bled to monitor donor-specific CD8+ T cell responses. (A) Percentage of gBT-1 CD8+ T cells in donor adult (solid) or neonatal (dashed) cells postinfection and subsequent i.v. challenge with WT Lm gB (5 × 104 CFU). (B) The ratio of the donor populations with respect to time indicates that adult donors become the majority population. (C) Phenotypic distribution of adult and neonatal donors at peak of primary response (day 6). Significance was determined by paired t test. Data are representative of 2 experiments (n = 8–12). ****p < 0.0001. The ability to develop memory CD8+ T cells postinfection is essential in protecting the host against recurrent viral and intracellular bacterial infections. However, the mechanisms that prevent neonates from generating robust memory CD8+ T cell responses are poorly understood. Previous reports have suggested that neonatal T cells fail to elicit robust memory cells because they are less responsive than adult T cells. However, our data point toward a different model, whereby naive neonatal CD8+ T cells are more reactive than adult T cells. This conclusion is supported by our data showing that neonatal CD8+ T cells respond more rapidly and undergo more extensive differentiation than adults postinfection with either a Gram-positive bacteria (L. monocytogenes) or a large DNA virus (vaccinia virus). Thus, the problem with generating large numbers of memory CD8+ T cells in early life does not appear to be due to a lack of responsiveness or proliferation, but rather that neonatal CD8+ T cells more quickly become terminally differentiated and lose their potential to transition into the long-lived memory pool. Although the underlying causes for increased terminal differentiation and reduced memory formation by neonatal CD8+ T cells are unknown, several possibilities are worth mentioning. First, the neonatal CD8+ T cell pool is predominantly composed of cells that have recently left the thymus (42), denoted recent thymic emigrants (RTEs). As previous work has demonstrated that RTEs in adult mice also have a propensity to adopt a short-lived effector phenotype (43), similar to neonatal CD8+ T cells, it is possible that many of our results can be attributed to a lack of postthymic maturation in early life. However, adult RTEs are not defective in mounting secondary recall responses. Moreover, a recent report showed that neonatal RTEs are phenotypically and functionally different from adult RTEs (42), indicating that other cell-intrinsic factors may be involved. A second possibility relates to the fact that neonatal mice have few peripheral CD8+ T cells. As a result, neonatal CD8+ T cells attempt to “fill” the available space by undergoing extensive homeostatic proliferation (24, 44–47). Therefore, it is possible that neonatal CD8+ T cells are more functionally reactive than adult CD8+ T cells because they have already divided numerous times before encountering foreign Ag. Finally, neonatal CD8+ T cells may rapidly become terminally differentiated because they are derived from a more metabolically active hematopoietic stem cell (HSC). During ontogeny, the thymus is seeded by a wave of highly proliferative fetal HSCs from the liver that give rise to neonatal CD8+ T cells (48–50). The fetal HSCs are later replaced by a more quiescent wave of adults HSCs that originate in the bone marrow (48, 51). Although fetal and adult HSCs express different genes (52), undergo different amounts of asymmetric cell division (53), and use unique programs of self-renewal (54), it is unclear whether the fetal origin of neonatal CD8+ T cells contributes to an altered program of memory CD8+ T cell development. Experiments to understand the relative contribution of all of these possibilities are currently under investigation. What is the evolutionary advantage of having CD8+ T cells that more rapidly become terminally differentiated and fail to transition into the long-lived memory pool? It is possible that neonatal CD8+ T cells respond more vigorously to infection to compensate for the lower numbers of CD8+ T cells and a less diverse TCR repertoire that is present in early life. Although a stronger primary response comes at the expense of not being able to develop robust immunological memory, it is likely more advantageous to protect the host during vulnerable stages of development than it is to generate memory cells, because it is unimportant what happens later if the host fails to survive the infection. However, as the naive T cell repertoire diversifies with progressing development and more optimal TCRs are produced, it may become more beneficial to respond with a more balanced CD8+ T cell response, so that many of these T cells expressing optimal TCRs will be retained in the memory pool and can rapidly respond to a secondary infection. Our findings also shed light on the competing models of memory cell differentiation. Previous work has argued for a model of memory cell differentiation whereby all naive CD8+ T cells have an equal potential to become memory cells, but those that receive greater amounts of stimulation become terminally differentiated effectors and die, whereas those receiving less (but sufficient) stimulation survive and persist in the memory pool. However, the different fates adopted by neonatal and adult CD8+ T cells responding to the same amount of stimulation raises the possibility that not all CD8+ T cells exhibit the same potential to mature into a memory cell. Given that the naive CD8+ T cell pool is composed of cells that were generated during different stages of development, it is interesting to speculate whether the spectrum of CD8+ T cell differentiation observed postinfection relates, at least in part, to the developmental origin of the CD8+ T cells that are recruited into the response. Several recent reports have highlighted many important differences in the neonatal T cell response (17, 55–61). However, it is often unclear whether altered behavior of neonatal T cells is due to a less diverse TCR repertoire, lower amounts of TCR avidity, smaller precursor numbers, or environmental factors. Thus, we have taken a reductionist approach and examined how monoclonal CD8+ T cells from neonatal and adult mice respond to infection in the same host environment. Although this experimental approach allows us to specifically focus on cell-intrinsic differences, one potential limitation of our study is that the behavior of neonatal cells was analyzed in adult mice, and not in the “normal” environment for neonatal cells. However, our previous work demonstrated the failure of neonatal polyclonal memory cells to develop strong recall responses in vivo (26), and the goal of this study was to identify whether this was due to cell-intrinsic differences or factors related to the neonatal immune environment. Given that we observe the same phenotype when neonatal cells are in an adult environment, we believe impaired neonatal memory CD8+ T cell development is due, at least in part, to cell-intrinsic differences. In summary, the data presented in this study provide new insight into impaired development of memory CD8+ T cells in early life. Our findings that neonatal CD8+ T cells skew toward a short-lived effector phenotype in a cell-intrinsic manner will need to be taken into account in the development of future strategies to enhance cellular immunity during early stages of development. This work was supported by National Institutes of Health Grants R00HD067290 (to B.D.R. from the National Institute of Child Health and Human Development), R01AI105265 and R01AI110613 (to B.D.R. from the National Institute of Allergy and Infectious Disease), and R01GM105668 (to A.G. from the National Institute of General Medical Sciences), the Cornell Center for Vertebrate Genomics (to B.D.R. and A.G.), and National Science Foundation Graduate Research Fellowship Award 2011078441 (to E.W.). The sequences presented in this article have been submitted to the National Center for Biotechnology Information’s Gene Expression Omnibus (http://www.ncbi.nlm.nih.gov/geo/query/acc.cgi?acc=GSE56575) under accession number GSE56575. 2001. Neonatal and early life vaccinology. Vaccine 19: 3331–3346.
. 2005. T cell-mediated immune responses in human newborns: ready to learn? Clin. Exp. Immunol. 141: 10–18.
. 2004. Neonatal adaptive immunity comes of age. Nat. Rev. Immunol. 4: 553–564.
. 2002. Respiratory syncytial virus infection suppresses lung CD8+ T-cell effector activity and peripheral CD8+ T-cell memory in the respiratory tract. Nat. Med. 8: 54–60.
. 1974. Immunological surveillance against altered self components by sensitised T lymphocytes in lymphocytic choriomeningitis. Nature 251: 547–548.
. 1974. Restriction of in vitro T cell-mediated cytotoxicity in lymphocytic choriomeningitis within a syngeneic or semiallogeneic system. Nature 248: 701–702. 1998. The numbers game for virus-specific CD8+ T cells. Science 280: 227.
. 2007. Effector and memory CTL differentiation. Annu. Rev. Immunol. 25: 171–192.
. 2008. Delayed maturation of an IL-12-producing dendritic cell subset explains the early Th2 bias in neonatal immunity. J. Exp. Med. 205: 2269–2280.
. 2009. Neonatal innate TLR-mediated responses are distinct from those of adults. J. Immunol. 183: 7150–7160.
. 2009. Phenotype and function of neonatal DC. Eur. J. Immunol. 39: 26–35.
. 2004. A defect in nucleosome remodeling prevents IL-12(p35) gene transcription in neonatal dendritic cells. J. Exp. Med. 199: 1011–1016.
. 2007. Induction of protective immunity to Listeria monocytogenes in neonates. J. Immunol. 178: 3695–3701. Philbin, V. J., D. J. Dowling, L. C. Gallington, G. Cortes, Z. Tan, E. E. Suter, K. W. Chi, A. Shuckett, L. Stoler-Barak, M. Tomai, et al. 2012. Imidazoquinoline Toll-like receptor 8 agonists activate human newborn monocytes and dendritic cells through adenosine-refractory and caspase-1-dependent pathways. J. Allergy Clin. Immunol. 130: 195–204.e199.
. 2007. Murine neonatal CD4+ cells are poised for rapid Th2 effector-like function. J. Immunol. 178: 2667–2678.
. 2001. High IL-13 production by human neonatal T cells: neonate immune system regulator? Eur. J. Immunol. 31: 3394–3402. 2003. Peripheral CD4+ lymphocytes derived from fetal versus adult thymic precursors differ phenotypically and functionally. J. Immunol. 171: 5157–5164.
. 2004. IL-4 utilizes an alternative receptor to drive apoptosis of Th1 cells and skews neonatal immunity toward Th2. Immunity 20: 429–440.
. 1992. Seeding of neonatal lymph nodes by T cells and identification of a novel population of CD3-CD4+ cells. Eur. J. Immunol. 22: 329–334.
. 2002. Naive T cells proliferate strongly in neonatal mice in response to self-peptide/self-MHC complexes. Proc. Natl. Acad. Sci. USA 99: 4538–4543.
. 2011. Evolution of the antigen-specific CD8+ TCR repertoire across the life span: evidence for clonal homogenization of the old TCR repertoire. J. Immunol. 186: 2056–2064.
. 2013. 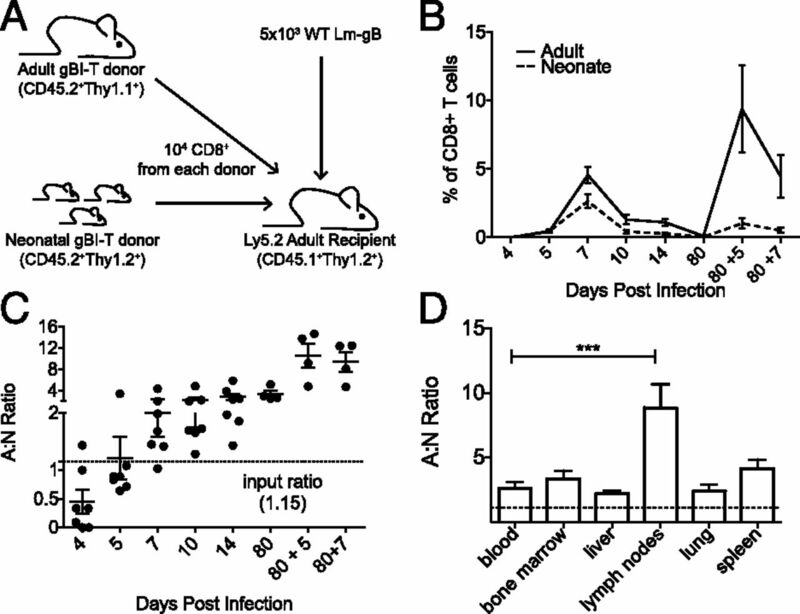 Acute neonatal infections ‘lock-in’ a suboptimal CD8+ T cell repertoire with impaired recall responses. PLoS Pathog. 9: e1003572.
. 2007. Monitoring lymphocyte proliferation in vitro and in vivo with the intracellular fluorescent dye carboxyfluorescein diacetate succinimidyl ester. Nat. Protoc. 2: 2049–2056.
. 2013. Differential analysis of gene regulation at transcript resolution with RNA-seq. Nat. Biotechnol. 31: 46–53.
. 2007. Optimization of TCR transgenic T cells for in vivo tracking of immune responses. Immunol. Cell Biol. 85: 394–396.
. 2007. Initial T cell receptor transgenic cell precursor frequency dictates critical aspects of the CD8(+) T cell response to infection. Immunity 26: 827–841.
. 2009. Runx3 and T-box proteins cooperate to establish the transcriptional program of effector CTLs. J. Exp. Med. 206: 51–59.
. 2010. Differentiation and persistence of memory CD8(+) T cells depend on T cell factor 1. Immunity 33: 229–240.
. 2010. Essential role of the Wnt pathway effector Tcf-1 for the establishment of functional CD8 T cell memory. Proc. Natl. Acad. Sci. USA 107: 9777–9782.
. 2013. Pathogen-specific inflammatory milieux tune the antigen sensitivity of CD8(+) T cells by enhancing T cell receptor signaling. Immunity 38: 140–152.
. 2011. Protective capacity of memory CD8+ T cells is dictated by antigen exposure history and nature of the infection. Immunity 34: 781–793.
. 2007. Manipulating the rate of memory CD8+ T cell generation after acute infection. J. Immunol. 179: 53–63.
. 2009. Murine neonatal recent thymic emigrants are phenotypically and functionally distinct from adult recent thymic emigrants. Blood 113: 5635–5643.
. 2009. Postthymic maturation influences the CD8 T cell response to antigen. Proc. Natl. Acad. Sci. USA 106: 4799–4804.
. 2004. Cutting edge: IL-7-dependent homeostatic proliferation of CD8+ T cells in neonatal mice allows the generation of long-lived natural memory T cells. J. Immunol. 172: 15–19.
. 2003. Neonates support lymphopenia-induced proliferation. Immunity 18: 131–140.
. 2003. Homeostatic control of T-cell generation in neonates. Blood 102: 1428–1434.
. 1987. Cell kinetics in the fetal mouse thymus: precursor cell input, proliferation, and emigration. J. Immunol. 138: 1026–1030.
. 1969. Tissue interaction in the development of thymus lymphocytes. J. Exp. Med. 129: 431–442.
. 2000. Characterization of T cell precursor activity in the murine fetal thymus: evidence for an input of T cell precursors between days 12 and 14 of gestation. Eur. J. Immunol. 30: 2201–2210.
. 2001. The importation of hematogenous precursors by the thymus is a gated phenomenon in normal adult mice. J. Exp. Med. 193: 365–374.
. 2007. Identification of a new intrinsically timed developmental checkpoint that reprograms key hematopoietic stem cell properties. Proc. Natl. Acad. Sci. USA 104: 5878–5882.
. 2006. Asymmetric and symmetric stem-cell divisions in development and cancer. Nature 441: 1068–1074.
. 2008. Stem cells use distinct self-renewal programs at different ages. Cold Spring Harb. Symp. Quant. Biol. 73: 539–553.
. 2003. Murine neonatal lymphocytes show rapid early cell cycle entry and cell division. J. Immunol. 170: 4548–4556.
. 2006. Neonate-primed CD8+ memory cells rival adult-primed memory cells in antigen-driven expansion and anti-viral protection. Int. Immunol. 18: 249–257.
. 2012. Environmental and T cell-intrinsic factors limit the expansion of neonatal follicular T helper cells but may be circumvented by specific adjuvants. J. Immunol. 189: 5764–5772.
. 2007. Protracted course of lymphocytic choriomeningitis virus WE infection in early life: induction but limited expansion of CD8+ effector T cells and absence of memory CD8+ T cells. J. Virol. 81: 7338–7350. 2003. Functionally mature virus-specific CD8(+) T memory cells in congenitally infected newborns: proof of principle for neonatal vaccination? J. Clin. Invest. 111: 1645–1647.
. 2011. Neonatal CD8 T-cell hierarchy is distinct from adults and is influenced by intrinsic T cell properties in respiratory syncytial virus infected mice. PLoS Pathog. 7: e1002377.
. 2008. Infection of mice with respiratory syncytial virus during neonatal life primes for enhanced antibody and T cell responses on secondary challenge. Clin. Exp. Immunol. 153: 277–288.